A common issue that AR managers bring up when discussing why they currently don’t follow analysts on blogs and Twitter is that it would be too much work. Hmm, maybe it could be a lot of work, but really the reality is that it does not take much time per day tracking posts and tweets. Why? The analysis concentrates on the average number of social media publications per day. In the tests and beta client engagements of our new SageToolTM Analyst Social Media Traffic Analysis (see graphic) we found that most analyst lists only had a small percentage of analysts that actively used social media and that the volume of traffic was modest. Of course there are a few analysts with exceptionally heavy user of social media, but so far they are rare. We also found that AR managers with accurate facts were significantly less anxious about tracking analysts. Once you have completed the analysis you have the data to enter into the tracking tools, Those AR managers who are trained on tools to use to efficiently track posts and tweets, have embraced adding social media to their other research tracking (e.g., research notes and press quotes). These tools can provide great analyst opinion tracking to be factored into your overall performance metrics. Bottom Line: With analyst usage of social media growing it is critical that AR managers start to monitor analyst commentary in social media. However, many AR programs are reluctant to add this data because of the perception that there would be significant effort required. To overcome this perception, AR programs should conduct an analysis of actual analyst usage of social media to determine the facts of how much work monitoring would require. Like this idea, but don’t want to do work creating a tool, gathering the data, and analyzing for a report? SageCircle can help. SageCircle has created a service for analyzing analyst social media traffic based on vendors’ analyst lists. The service uses our SageToolTM Analyst Social Media Traffic Analysis and provides recommendations. Why stress out about performing this analysis when you can have SageCircle do the work for you? Contact us at “info [at] sagecircle [dot] com” or 503-636-1500 for more information and setting up a purchase order. 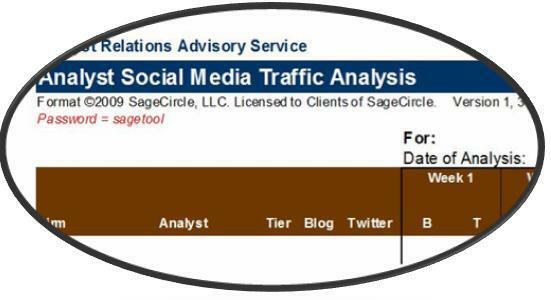 Click here to purchase a SageCircle “Analyst Social Media Traffic Analysis” service using your credit card. Question: AR – Do you monitor analyst commentary on social media, especially blogs and Twitter? If no, why not? If yes, what tools do you use and how much time do you devote to it on a daily and weekly basis?